How to Link Aadhaar and PAN to LIC Policies – Online and Offline – step by step guide. As per the latest circular from IRDA, it is mandatory to link all the insurance products with the PAN number and Aadhaar. IRDA’s intention behind this notification is to prevent money laundering and abide to the AML guide lines. IRDA has instructed that all insurance products including Health Insurance and General Insurance has to follow the instructions with immediate effect. Further to add, the instructions clearly state that those who do not have PAN cards should declare that in Form 60. I have discussed about Form 60 and its implications later in this post. Life Insurance Corporation of India has taken steps to implement PAN and Aadhaar linkage process through Online and Offline methods. 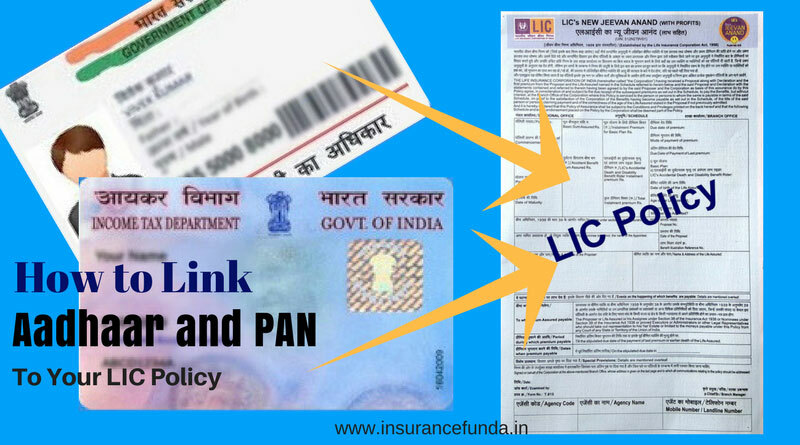 How to link Aadhaar and PAN to LIC policies – Online? Before starting the process, it is better to keep in mind few things to enable smooth completion of linking. Keep your complete list of policies, Aadhaar Card and PAN card readily available. Verification of the data supplied by you at LIC’s end with the database of UIDAI can take few days. SMS and Mail communication will be send to you on successful completion of the linkage process. Step 1 : Visit LIC’s Web site. Locate the link “Link Aadhaar and PAN to LIC Policies” and click on that. Step 2 : Fill the details as mentioned in the form. Name (as per Aadhaar), Date of Birth, Aadhaar number, gender, Email ID, mobile number (which is registered with Aadhaar), PAN number, and policy number etc has to be submitted. Step 3 : Click on the button “Get OTP”. You will receive the OTP on your mobile number within a few minutes. Enter the OTP received and click on Submit button. Step 4 : A Message will be shown on the success of the registration for linkage process. Step 5: Verification of the details submitted by you with UIDAI will be done at LIC’s end . Once the verification process is successfully completed, you will receive an SMS / mail confirmation on the successful linkage. please remember that the verification process takes few days as of now. How to link Aadhaar and PAN to LIC policies – Offline ? Online linkage of Aadhaar and PAN to LIC policies is a simple process and can be completed in few minutes. It is generally recommended to use online process as it is easy and fast. But in case you are unable to use online process, you can very well use ‘Offline’ process as well. You will have to download the form given below, fill the details and submit the form along with self attested copies of Aadhaar card and PAN card to the nearest LIC Branch office. Those who do not have PAN card can submit form-60 instead. Use the following form for offline linkage of Aadhaar and PAN with LIC policies. Click here to download Aadhar / PAN linkage mandate form. What is form 60 and things to know before submitting it. All the persons who have a PAN card should link it to his/her insurance products as per the IRDA instruction. If a person do not have a valid PAN card then the next available option is to declare that in a specified format called form 60. Form 60 is a necessarily required document from an individual to carry out financial transactions when the concerned person is not having a PAN Card. Form 60, however, should be supported by a relevant address and identity proof. Click here to download Form 60. What will happen in the case of a fraudulent submission of form 60 ? Any person who provides a false declaration in the statement will be punishable under section 277 of the I-T Act. Imprisonment of not less than three months to the maximum of seven years can be imposed with a fine for getting indulged into the fraudulent activity. The person accepting the declaration shall not accept the declaration where the amount of income of the nature referred to in item 22b exceeds the maximum amount which is not chargeable to tax, unless PAN is applied for and column 21 is duly filled. So be careful while submitting form 60 declaration.